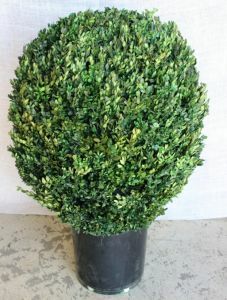 Carefully trimmed and crafted to perfection, this large—but not overwhelming—20” Boxwood Globe is an outstanding topiary plant for a number of reasons, and accordingly, can complement any area’s style and appeal. Its carefully trimmed and designed look is further enhanced by truly elegant and eye-catching green leaves, which will positively excite most any onlooker. In addition to looking excellent and being entirely unique and exciting, this Boxwood Globe is guaranteed to last. All of our preserved topiary plants are crafted and treated with care, and there is no exception to be found here. Our careful and state-of-the-art preservation process begins by placing our plants inside top-quality, adjustable humidity and temperature spaces. It is here that they are exposed to low humidity and hot temperatures, to initiate a dehydration of sorts. But don’t worry—these same plants will be able to drink in no time at all! They are then treated with a carefully composed glycerin solution, which is designed to initiate the preservation process. In many plants, we will also add some dye coloring, to alter or preserve the radiant colors and hue of leaves. Every one of the ingredients which we utilize in the preservation process, from the glycerin to the food dye, is all natural, and completely safe for our customers and their loved ones to be around. Of course, we also spend a good deal of time crafting the shape and design of each of our topiaries, and the 20” Boxwood Globe is no exception. Its globe-like shape is completely balanced and proportioned, and its overall design and outline truly is like that of a globe—completely spherical. This topiary plant could really fit inside of a globe, if it needed to! But, stuffing the boxwood globe into an actual globe wouldn’t be wise, as its outstanding beauty and quality of appearance couldn’t be enjoyed. Moreover, the process may also damage the plant. For however unlikely this is, other seemingly innocent actions can cause some problems for a topiary plant, in all seriousness. Owners shouldn’t water their topiary plant, nor should they expose it to direct sunlight or store it outside. Animals and bugs will target it when stored outside, and the sunlight and water, contrary to assisting the plant, will actually damage it. Let our top-notch preservation system works its long, seven-year-minimum magic! With all of these points in mind, there is essentially no reason to not enjoy the 20” Boxwood Globe. Its leaves and overall color are radiant and welcoming, and its spherical and globe-like shape is perfectly crafted. Additionally, the piece is incredibly durable and long-lasting, and in coordination with this point, is available for purchase for a price that encompasses a massive amount of value. Take a step towards enjoying a gorgeous and exciting living area, room, or other space tomorrow by purchasing the incredible 20” Boxwood Globe topiary today!